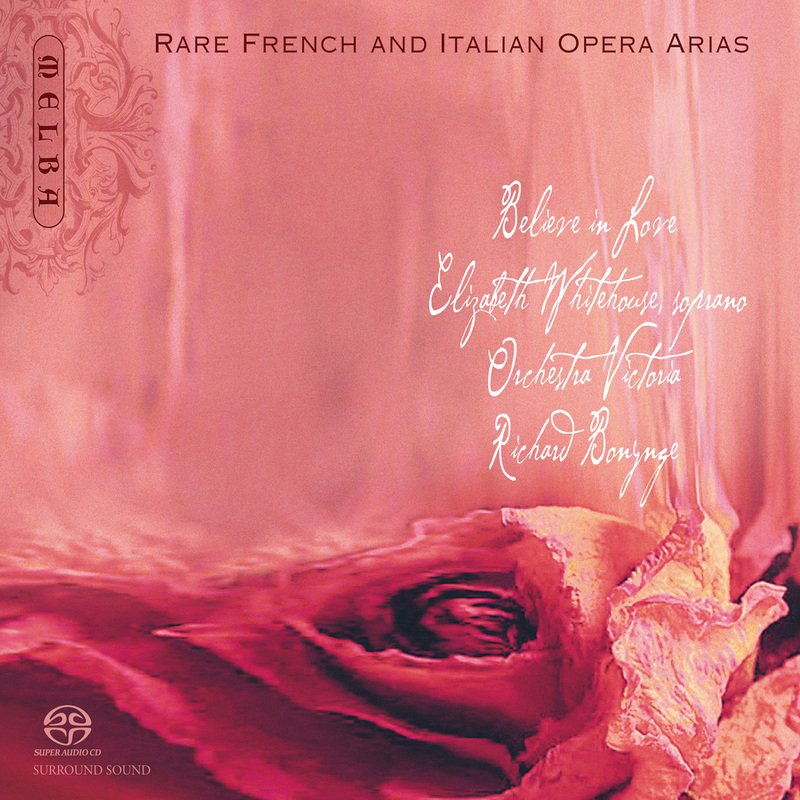 A fascinating collection of rare French and Italian opera arias, shining a light on the creative ferment at the beginning of the verismo movement in opera in France and Italy. Featuring arias of remarkable beauty and explosive drama from the treasure trove of Richard Bonynge’s personal manuscript collection. Including several Gounod arias of the previous fashion and astounding contributions from Giordano, Cilea, Mascagni, Faccio, Gomes and Leoncavallo. 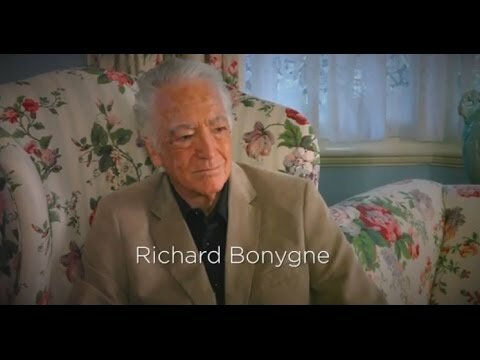 ng numerous world premiere recordings, with the combined talents of maestro Richard Bonynge, Orchestra Victoria and leading Australian soprano Elizabeth Whitehouse, Believe in Love also features original cover and label artwork by the award-winning designer, Ken Cato. Released in stunning Super Audio CD surround sound. What is this? No Verdi, no Puccini or Wagner? In this recital Elizabeth Whitehouse and Richard Bonynge explore the soprano repertory from 1850 to 1920, including some favourites it is true, but also some great rarities. It was during this period that opera moved from the end of the bel-canto era and, with the widespread influence of the three composers mentioned above, underwent so many changes that it is hard to overestimate the revolution in musical styles that occurred. Within one person’s lifetime it would just have been possible to hear the final works of Rossini in Paris in the 1860s and the premiere of Schoenberg’s Erwartung in 1920. Orchestras got bigger and louder; theatres were re-designed with orchestra pits and modern lighting meant that it was possible to darken the auditorium and concentrate the audience's attention onstage. The demands on singers grew ever more arduous as composers and librettists began to favour modern and frequently melodramatic plots. Among the heroines that Elizabeth Whitehouse portrays, Adriana dies from poison, Madeleine in Andrea Chéniergoes to the guillotine, Sappho and Ophelia both drown themselves, Stefana in Giordano’s Siberia is shot while trying to escape from the prison camp, poor Isabeau (Lady Godiva) is assassinated along with her beloved Folco, while newly-wed Gloria commits suicide at the altar, after her bridegroom is stabbed. Perhaps it comes as a relief to turn to Leoncavallo’s Zazà, who is a star of the music hall and behaves with great discretion when she discovers that her lover is married with a family. She dismisses him and continues with her career — a modern woman. The earliest work here is Sappho (Track 1) by Charles Gounod (1818-1893). This was his first opera, composed for the great mezzo-soprano Pauline Viardot. She was at the height of her fame in 1851 when she persuaded the management of the Paris Opera to take a work from the unknown Gounod. Viardot was as famous for her acting as she was for her voice; the role of the priestess-poet Sappho was tailor-made for her and the climactic scene, in which she throws herself into the ocean, has remained the single most famous moment from the score. It launched Gounod’s career. The other three operas by him from which we hear arias are all rarities. In La Reine de Saba (Track 2), Balkis, the Queen of Sheba salutes the bravery and ardour of the master-builder Adoniram who is, she sings, ‘Nobler than a King’. Cinq Mars (Track 5), based on a famous novel by Alfred de Vigny, concerns a failed plot against Cardinal Richelieu, whereas Le Tribut de Zamora (Track 7), Gounod's final opera, is an exotic tale of a Spanish maiden sold into slavery. Camille Saint-Saens (1835-1921), like Gounod, was encouraged by Pauline Viardot, for whom he composed his most famous work, Samson et Dalila. In Étienne Marcel, (Track 6) he wanted to celebrate the people of Paris, in a story about a popular uprising the 14th century. The heroine, Beatrix, is torn between loyalty to her father, Marcel, and her love for a royal equerry, Loris. Among the Italian operas, the earliest featured here is Amleto (Track 3) by Franco Faccio (1840-1891). This is particularly interesting as it has a libretto by Arrigo Boito, the poet and composer who supplied Verdi with the libretti for Otello and Falstaff. Here, many years earlier, he cut his teeth on Shakespeare with this version of Hamlet. Faccio and Boito were lifelong friends and, although their collaboration was not a success, Faccio went on to become the musical director of LaScala, Milan, and he conducted the premieres there of several important works, including Verdi’s Otello and Ponchielli's La Gioconda. Amilcare Ponchielli (1834-1886) was at one time seen as a possible successor to Verdi, though only one of his operas ever really caught on — La Gioconda. 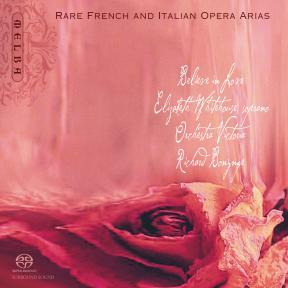 In Marion Delorme (Track 8), his last opera, he turned to a play by Victor Hugo, about the noble-hearted courtesan Marion, whose affairs come to a bitter end when both her lovers are executed on the orders of Cardinal Richelieu. Although immensely effective, like so many of the half-forgotten works here, it demands such grand staging that few modern impresarios would take a risk with it. Carlos Gomes (1836-1896) was the most admired Brazilian opera composer of the 19th century. At least six of his works were given premieres at La Scala, although Salvator Rosa (Track 4) was a commission from Genoa. Another opera about revolutionaries, this one is set in Naples in 1647, when the painter Salvator Rosa is drawn into the plot against the occupying Spanish forces. The heroine suffers a double fate — having already taken poison, rather than marry a man she does not love, she then stabs herself. The other four featured composers are all members of the school that has come to be known as verismo. The names of Pietro Mascagni (1863-1945) and Ruggero Leoncavallo (1857-1919) are forever linked because of the worldwide popularity of their two short operas, almost always played together, Cavalleria Rusticana and Pagliacci (affectionately known as Cav and Pag).Here they are in different moods, Mascagni with the tragic tale of the thwarted love affair between Lady Godiva and Folco in Isabeau (Track 17), and in startling contrast the title-song from his operetta Sí (Track 18), in which he demonstrates that, had he chosen to, he could have rivalled Lehar and Kalman. Leoncavallo’s Chatterton (Track 10) is a fantasy based on the short life of the English poet; although it was Leoncavallo’s first opera, it did not receive a staging until he had established himself with Pagliacci. Zazà (Tracks 11&12) is based on a famous play by Pierre Berton and Charles Simon, which had been a favourite role of the celebrated French actress Rejane. In this opera Leoncavallo draws on his nostalgia for Paris in the 1880s, where as a young man he had first tasted success. Umberto Giordano (1867-1948) found his first triumph in Andrea Chénier (Track 9), a work that has never faded from the repertory, providing as it does three meaty roles for accomplished singing actors. Here, Madeleine’s Act 3 aria, ‘Lamamma morta’ is the heroine's only solo, but one that gives every opportunity for dramatic effect. Siberia (Track 14) has never known the same popularity, but its story of a wronged woman who confronts her seducer once they are both exiled in the frozen wastes has a peculiar power. Not only does he create his characters,but in true Italian fashion he endows them with an inborn capacity for expressing human feelings through a vocal line.